You think nairabet is just a website for staking online betting on football, basketball, tennis, etc.if so, then you are wrong. nairabet has introduced presidential candidate bets on their online betting platform which you can stake your bet on.who do You think would win the up coming election, goodluck Jonathan or buhari. who do you think is going to be the winner.if you are a fan of Jonathan, now its time to stop talking and put your money where your mouth is.you too can get a bite from the election.the top two contenders are good luck Jonathan and buhari, the rest others have large odds which off course have no hope of winning. So hurry now and stake your bet before the odds reduces. Currently, goodluck jonathan is given 1.40 odds while buhari is given 2.0 odds. So who are you staking your bets on.goodluck jonathan or buhari. 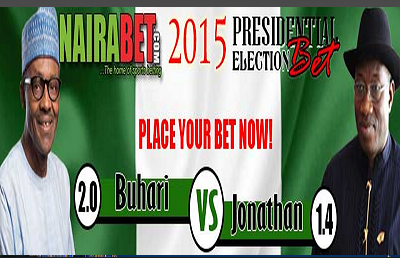 No Responses to "Stake Your Bet On Jonathan Vs Buhari Election On Nairabet : Who Is Going To Win The Election"